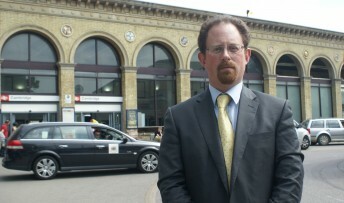 MP Julian Huppert is celebrating after news that the government has changed its mind over a massive hike in rail fares in the New Year. Liberal Democrats have been fighting to keep prices down for passengers, arguing that rail fares are already too high. Julian, as co-chair of the Lib Dem Transport Committee, has been putting pressure on Ministers for over a year to get this reduction. The planned increase in prices will be reduced by two per cent in January from RPI+3 per cent to RPI+1 per cent for a further two years. Under the last Labour government, rail fares went up by 66 per cent, well above inflation. Julian said: “This is very good news for Cambridge commuters. This planned price increase has been hanging over their heads, leaving many worrying about how they were going to afford to get to work. “I believe that rail fares are too high and should be reduced in real terms by capping them at less than inflation. The time has come to end the era of above-inflation rail fare increases. But this is a welcome and significant step in the right direction. “We do need to invest in our railways to put them on a stable footing, and ensure that the rail industry plays its part in delivering lower costs and sustainable railways; but we cannot expect rail passengers to take the burden. “Families across our city are struggling to make ends meet against a backdrop of rising utility bills and food prices. Many of them have to use the trains to get to work and it would be totally unacceptable to expect them to absorb a huge rise in fares.